Where do I use my Proactiv+ voucher code? Proactiv’s solution is simple. With just three easy and quick steps you’ll be on your way to clear and radiant skin in no time. All you have to do is use the skin smoothing exfoliator, pore targeting treatment and complexion perfecting hydrator, two times a day, to achieve picture perfect, flawless skin. Purchase up to 90-day’s worth of products including the three-step basic plan, complete face plan month supply and 90 day complete face plan as well as the smoothing exfoliator, pore targeting treatment, green tea moisturiser, charcoal cleansing brush, redness relief serum, skin purifying masks, mark fading pads and much, much more. Shop for all these products and kits based on your skin’s specific needs. Check out the ‘your skin’ section on the Proactiv+ website and talk to the expert dermatologist about what your skin needs. Learn how to cook clean to reduce redness, blemishes and spots, discover more about blemish control and skin care and raise any concerns you may have on adult and teen skin concerns too. If you’re looking for support on your skincare journey then make sure you take a look at the community section at Proactiv+. Here you will find reviews from previous customers as well as real experiences and stories from real people that know how it feels to suffer from bad skin. You can even read celebrity stories from people like Georgie Porter, Amy Willerton and Kendal Jenner, as well as stories from bloggers and other social media influencers that have found success in Proactiv. In this area, you also have the opportunity to share your own skincare story. Inspire others that are nervous to give Proactiv a try and give your honest opinion on all the Proactiv skin care products and kits that have worked for you. Begin your skin care journey with the basic, three-step plan. For just £18.74 you will receive a 30 day supply of tried and tested products that are sure to clear up problematic skin of all types, ages and colours. Order a one-off supply to try or subscribe for monthly deliveries and take back charge of your skin. With the three-step plan, you can cleanse, clear and hydrate twice a day to prevent breakouts and blemishes that may have been bringing you down. So how does this three-step plan work you may be wondering? Step 1: the cleanser and exfoliator will help clear breakout-causing impurities, step 2: the skincare products will then get to work in the pores where blemishes start, step 3: your products will then provide hydration and help to reduce the appearance of redness and marks, leaving your skin with a healthy, happy glow. The basic, three-step plan includes the skin exfoliator, the pore targeting treatment and the complexion perfecting hydrator, as well as a free gift for you to enjoy. Who is Proactiv+ designed for? Proactiv+ is for any teen or adult who struggles with blemish-prone skin and suffers from breakouts. Proactiv+ works for men and women of all ages and will appeal especially to women in their twenties, thirties, forties and fifties who desire high-quality skincare products. Can I use Proactiv+ products on my body as well as my face? Yes, you can use Proactiv+ in any blemish-prone areas. If you are particularly prone to body blemishes, you may want to look at our Proactiv+ line extensions. Will Proactiv+ clog my pores? Proactiv+ is a dermatologist developed, scientifically proven 3-step clear skin system that’s designed to get your skin clear and keep it clear. Proactiv works inside your skin’s pores to kill unhealthy bacteria on contact and eliminate dead skin cells, debris and excess oils that can clog your pores. You’ll find a huge selection of products, kits and plans at Proactiv that can target blackheads and whiteheads to prevent breakouts and acne that may be affecting your confidence and self-esteem. 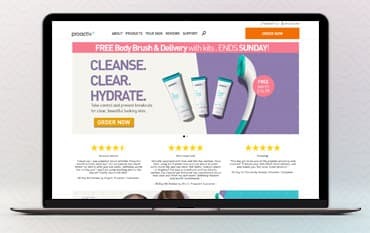 Shop online for skin plans that’ll work for your skin specifically and make sure you use a Proactiv+ discount code from us to save money on your purchases.